A book about a woman whose job it is to restore graves and bring forgotten and overgrown cemeteries back to life? Yes please! Oh, and she can also see ghosts? Hell yes! 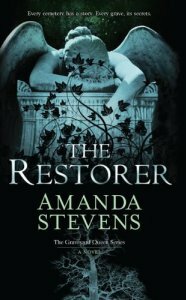 I give you The Restorer by Amanda Stevens. Amelia Gray has her own blog and is called the Graveyard Queen for her knowledge of graves and cemeteries and her expert work restoring them. This is the first in the Graveyard Queen series, and I had high expectations that unfortunately came crashing down for two reasons. Firstly, the romance. There was wayyyy too much romance in this novel for my liking, and in particular the forbidden attraction Amelia has for Devlin. Secondly, Amelia quickly becomes caught up in a murder investigation in a cozy mystery kind of way, that was supposed to keep the story moving but wasn't required in my opinion. The Restorer is a gothic read that was smothered with a romance and murder investigation when I would have been happy to read an entire book about Amelia just doing her job. Her father's rules for living, cemetery restoration and living amongst ghosts were fascinating but quickly shoved aside in favour of the above. With such a promising premise, what I ended up with was a relatively dull paranormal romance.